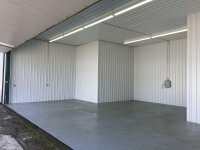 Hangar E-6 is located at the West end of the row of T hangars so it boasts extra room off the port wing which could easily become your office, workshop or man cave. A West-facing window allows natural light and overlooks the approach end of Rwy 19. 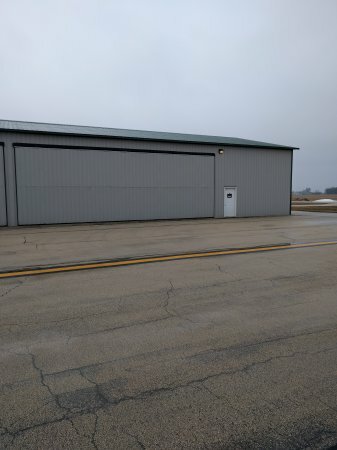 The entire hangar (including the electrically operated bi-fold door) is well insulated and the solar powered in-floor heat keeps the hangar at a steady 55 degrees all winter long. Overhead fluorescents provide great lighting. 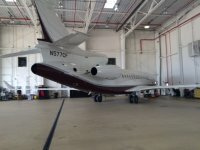 The floor is coated in slip-resistant epoxy. 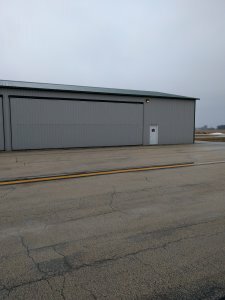 This hangar easily accomodates my E-55 Baron. The interior dimensions are included below. There is a current tenant providing steady income in case you don’t need the space right now.